The first week of July marks one of the busiest times of the year for South Carolinians to be on the water. With over half a million registered boaters in the state, everything from the boat cleaners we use to how we throw away filleted fish has a serious impact on the health of our waterways. So before you hit the water to enjoy the sun and salt this weekend, consider these eight ways to be a smarter, cleaner, safer boater. Fueling your boat, when done carelessly, presents a risk of leaks and spills that can pollute our waterways. When you’re fueling up, always stay in the area and do not ‘top off’ the gas tank. Catch drips from the fuel intake and vent overflow with oil-absorbent materials like the bibs pictured below. Gas-saturated bibs/pads can be air-dried and reused. Bibs saturated with diesel fuel or oil should be double-bagged and thrown in the trash. 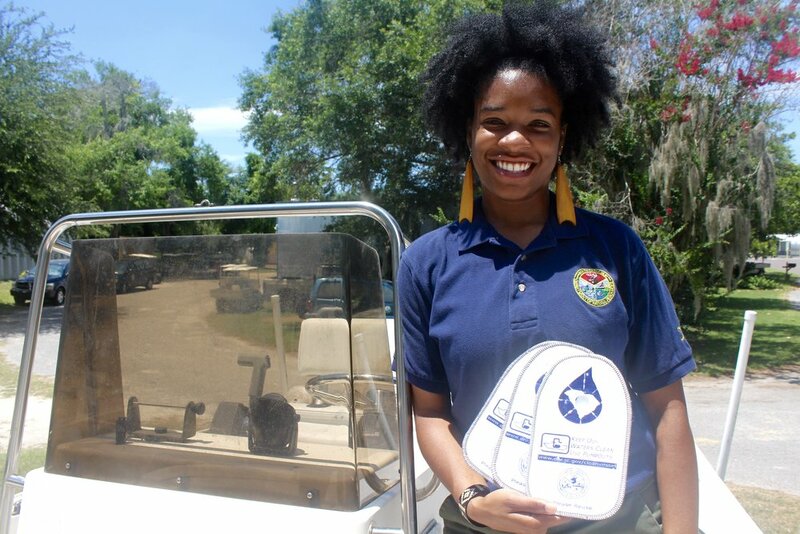 SCDNR offers fueling bibs at public events such as boat shows; contact coordinator Beatriss Calhoun at calhounb@dnr.sc.gov if you’d like to learn more. Wildlife watching is one of the most enjoyable parts of boating on our coast. But animals such as manatees and sea turtles are at particularly high risk of being killed by boat strikes – in fact, it’s the most common cause of death for sea turtles in South Carolina. In 2017 alone, 73 sea turtles were killed by collisions with vessels. Help safely share the water with these creatures by boating slowly when you’re in shallow coastal areas, which they like to frequent. Always keep a lookout for animals moving in the water. We’ve likely all seen it on the water – the boater speeding so quickly they don’t notice the trash flying from the stern. Don’t be that boater. Bring food in reusable or recyclable containers or buy products that don’t have excessive packaging. Secure your trash so that it doesn’t blow overboard – and if it does, be sure to turn around and retrieve it. A great practice to follow is “plus one boating,” whereby you bring home every piece of trash you take out on the water – plus something extra. Unfortunately, plastics pollution is a significant issue in our oceans, and trash is not uncommon to see even miles offshore. Being smart about sewage is a no-brainer for anyone who appreciates clean water. You should never discharge raw sewage into South Carolina waters – in addition to being illegal, raw or poorly treated sewage can transmit diseases and cause rashes in humans, infect shellfish (which may then make oyster lovers sick), and cause algal blooms that kill fish. The best option is to use onshore restrooms; the second-best option is to use a well-maintained head or marine sanitation device. If your boat has a head, make sure to follow the manufacturer’s maintenance recommendations and regularly pump out and rinse your tanks. SCDHEC’s Marina Mate App shows where you can find a pump-out station and other services provided by marinas around the state. Antifreeze, oil, and lead-acid batteries and (and in some cases must) be recycled in South Carolina. But did you know you can recycle fishing line and oyster shells, too? Monofilament deposit bins are at many boat landings and offer a place to recycle your used fishing line. 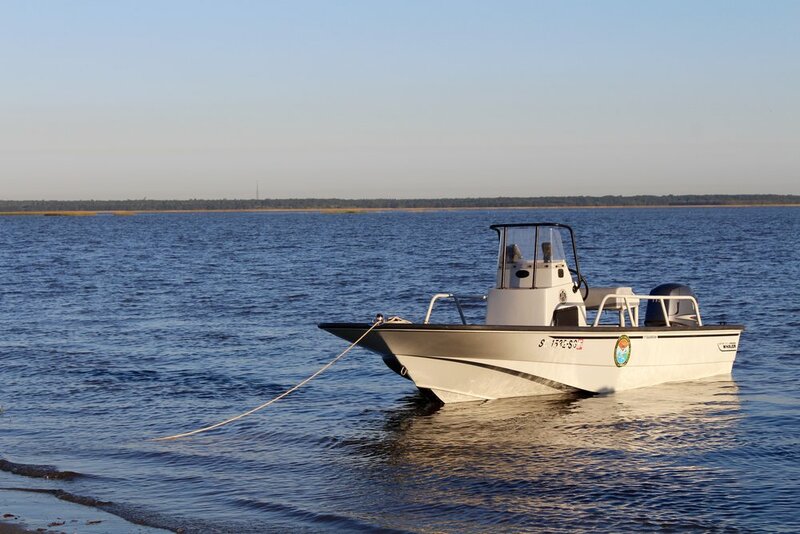 A lot of South Carolinians use their boats to access shellfish harvest grounds in the cooler months. If your family likes to do that, please remember to recycle your leftover oyster shells – SCDNR biologists need them to help rebuild oyster reefs. Find drop-off locations here. In South Carolina, you cannot fillet any fish or shark with size limits until you’ve returned to shore. Once you do, don’t throw your bones and entrails into swimming areas, marinas, or on oyster beds. Some landings offer fish-cleaning stations where you can discard your fish in the trash. If throwing away at home, we suggest freezing until the day of trash pick-up and/or double-bagging to reduce the smell. Better yet, though, don’t let those bones go to waste – you can freeze fish leftovers and reuse them as bait, cook them down into fish stock, or put them to work in your garden after composting. Your choice of cleaning products can have a dramatic impact on water quality and wildlife. Luckily, fresh water and a sponge can go a long way toward reducing your need to use harsh cleaners on your boat. Furthermore, a good coat of wax will also keep surface dirt from becoming engrained and requiring detergents to clean. At some point, though, you’ll need more than water – and when that happens, we recommend using phosphate-free, biodegradable, and nontoxic cleaners. Next week, we’ll share a detailed list of natural alternatives for cleaning up your boat that are water- and wildlife-friendly. If you’re an experienced boater, share your wisdom with other boaters! Support marinas that are environmentally responsible and provide amenities like trash cans, recycling bins, and pump-out stations.